A little worn, a little faded — and oh, the melancholy of the fallen leaves. If this isn’t a moment for a cigarette and an absinthe, nothing is. They’re few and far between now. Sometime in the past decade, they were joined by this, um, terrier, and now even he is looking a little decrepit. 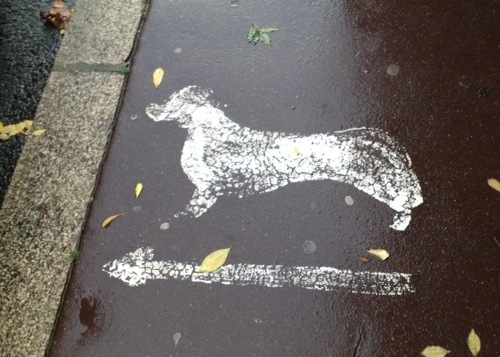 Much good they do — Paris is by no means carpeted with dog poop, as I’d feared when I trolled around the Web before this visit, but the poop you see is more often on the sidewalk than it is in the gutter. Between the traffic and the parked cars and the gutter sluicing (a frequent and, to a visitor, unpredictable occurrence), I don’t see a future for the curbing campaign. 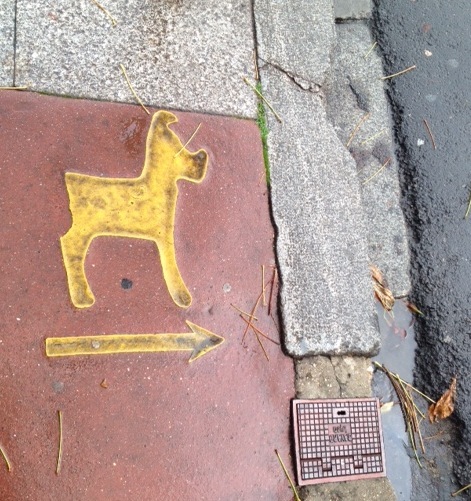 Ahhh, so that’s what “curb your dog” means! I’ve been scratching my head over that one for a while and always forget to look it up by the time I get home. Merci! 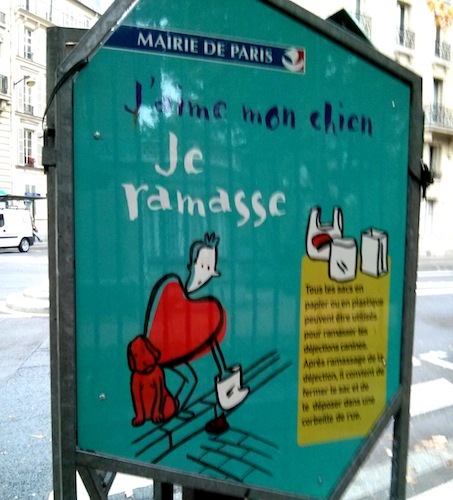 What ever happened to the Chirac–that poop vacuum cleaner that made Jacque Chirac so popular when he was Mayor of Paris? I use to hear that thing early in the morning on its rounds in the Rue Cler. Ha! I did not know that the Motocrottes were called “Chiracs”! Sadly, they were taken out of commission in an effort to save costs — Wikipedia says in 2002. Maybe it was just American tourists who called them that. I can’t remember where I first heard/read about it, but they sure were useful when they were working. Parisians must have gotten used to them. Hard to go back to doing it the manual way when you are accustomed to a machine doing it for you! I’m a fan of any sign that is set in Hobo. Though it does seem more appropriate for a Hawaiian Spam Truck or something… Oh, and in the last sign, is that person wearing a sandwich board shaped like a heart? Maybe he’s secretly a slab of organ meat with a head and limbs? 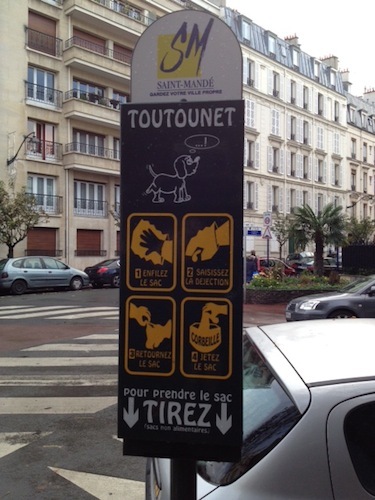 I love that it wants you to curb your dog and THEN pick up the poop.